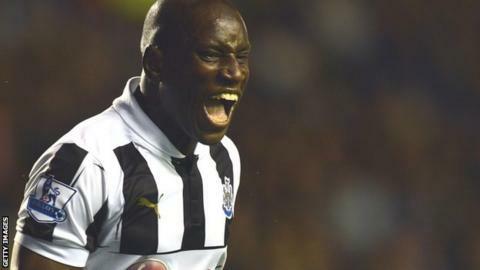 Newcastle boss Alan Pardew has admitted last season's top scorer Demba Ba could leave the club for £7m in January. The 27-year-old Senegal striker is believed to be frustrated at his current role at the club and talks over a new contract have reached an impasse. It was thought Ba's £7m buy-out clause expired on 31 July, but Pardew revealed it is still active in the new year. "There is that clause in his contract and it makes us vulnerable, " he said. "It's still open in the next window." The former West Ham striker's absence from the squad that travelled to Portugal for Thursday's Europa League tie with Maritimo is not linked directly to the ongoing situation. Newcastle are, however, exasperated by comments made by his agent Alex Gontran on Tuesday which suggested his client might seek a move away if he continues to play second fiddle to Senegal team-mate Papiss Cisse in the Magpies' attack. Pardew revealed he held talks with Ba before the squad left for Portugal and stressed that such statements would not be tolerated and that he wanted Ba to remain at the club. "'I have spoken to Demba [about his agent] and told him I was disappointed with some of the comments around him," Pardew added. "Sometimes it's out of his control and out of my control. "But we know each other well enough, and I've got no problems with him, because he is a team player who wants to do his best for the team. He has always been like that. "I just think the agent stuff was people saying things they shouldn't say, really. It doesn't really affect myself and Demba, because we've got a very good relationship." Ba's frustration is believed to stem from the second half of last season, when he was regularly deployed on the left to accommodate fellow Senegal international Cisse, who was signed from Freiberg in January. Despite starting the new season in his favoured position through the middle, Ba expressed his displeasure at being a substitute for Monday's 2-2 draw at Everton, where he came off the bench to score both goals.